Boohoo is an online clothes retailer who dabble mainly in clothes, shoes and accessories for both men and women. The company was first established in 2006, by Mahmud Kamani and Carol Kane, and now has grown to be one of the leading fashion retailers, and employs over 1,000 people. Their aim is to offer a wide variety of different products to a young adult audience, predominantly an ‘online fashion retailer, aimed at 16-24 year olds’ (Wikipedia, 2017). They sell a number of branded products and their own- brand, with hundreds of new products coming out each day, which can be found on their site. The sector which Boohoo is a part of, is the online fashion industry. The sector as a whole aims to provide products which the customer wants, on a web store which they find appealing (Pierce, 2012). Boohoo has seen a significant increase in their customer base. Engaging content and investments in the technology platform have helped drive this growth, adding to November of 2017, where 16.42 million visits were recorded, which was a vast increase of 29.25% from the previous month of October, where there was only 12.7 million visitors. Their traffic comes predominantly from the UK, as it is a UK based website, but has started to gain traction from the USA and France, who have both grown their visitor bases significantly. Chaffey’s Six Channels are a tool developed by Dave Chaffey, which assists the developers of websites and social presences to make improvements on their digital platform. Most of the online retailers have incorporated at least a few of these channels, but the ones who are most successful will have put more time into designing their website and ticked the boxes of what makes an effective site. There are a few main points which make a successful online store, (Pierce, 2012), which include ease of navigation, which goes hand in hand with a minimal design. A checkout where there will be no confusion, and an accurate description and showcasing of the products which they have, all will make a website appealing for a customer to come back, rather than see the homepage and click off. This is a problem for a number of sites, as there will be a lot of effort put in on their part, for the customers to just click off. This is tracked through their ‘bounce rate’, which in Boohoo’s case is 28.95% (SimilarWeb, 2017). 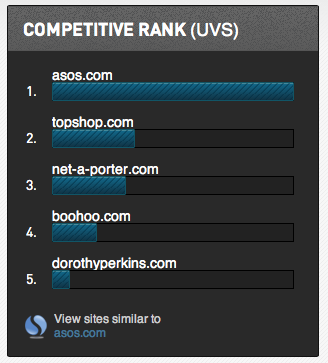 This seems to be fairly standard, as ASOS, a similarly minded online fashion retailer, have a bounce rate of 24.46%, even though they are a significantly larger company. 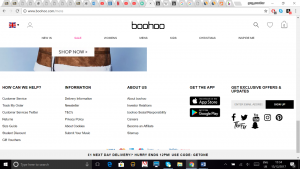 When I examined the search marketing for Boohoo, I found that they have chosen not to pursue it in a great way. Though they still got 16 million visits which is impressive, it pales in comparison to their close competitor ASOS, who achieved over 80 million. However, (SimilarWeb, 2017) we can see that 36% of their traffic comes from searching. This being said, nearly 97% of it is organic searches, leaving very little from paid searches. Also, when looking at the ‘source’ on the web page, there are next to no keywords which will help it pop up more. This shows that they are not keen on the paid searches option, meaning they do not follow Chaffey’s first channel. This also is apparent, as you must scroll to the third page of ‘online fashion retailers UK’ for Boohoo to make an appearance. ‘While there is a cost associated with paid search (while SEO doesn’t cost money) it’s an investment in your marketing that’s worth the cost’ (Neeley, 2013). This is made apparent when we realise how far down the search list is, for not incorporating keywords and paid searches on their website. I feel like this is an area in which Boohoo are failing to make an impact, and for further success should look into investing in paid searches, so as to widen their customer base even more. The other of Chaffey’s channels which I will be assessing is social media marketing. Some websites have done this to great effect, and as social media itself is free, it can make a very cost effective form of advertising. ‘Social media marketing is a tool we use to inform consumers about our products, who we are and what we offer’ (Lake, 2017). 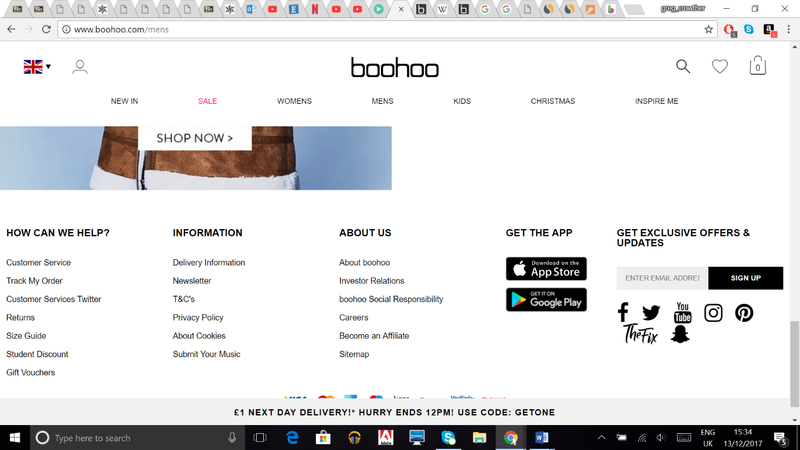 On the Boohoo website we can see that social media links are in quite a small cluster on the bottom of the page, which is very easy to miss. However, this backs up them only having 3.27% of traffic coming from social media, a much smaller chunk than from search or referrals. However, this being said, they have still accumulated nearly 500,000 followers on twitter, and 2.5 million likes on their facebook page, though once again, their statistics are all significantly lower than those of their competitor ASOS. Overall, I feel Boohoo is a promising online retailer, who may not currently have the largest share, but with a few improvements on the social media aspect, and changes they should consider with paid searches, as ASOS have 25% paid search, compared to Boohoo’s 3%. This is the only noticeable difference in their marketing plan and with these changes I feel Boohoo could become a closer competitor. As shown by the diagram, the gap between ASOS and Boohoo is wide, but they have a number of other competitors who they are in a close battle with.